John Leak & Mary Clara "Polly" Dendy had 10 children, the youngest of whom was our grandmother, Elizabeth Leak Carlile. All of John and Polly's children were born in Laurens County, SC before the family moved to Cass (later Bartow) County GA in 1843. Photos from the collection of Mrs. Rosina Loftis McDougal, courtesy of Robert C. Dodd, Jr., contributed by Larry Marcus Kirklen. How did we get these photos and where did they come from? Through the wonders of the Internet we're able to share these photos of grandparents, John and Polly Leak, but only because someone a long time ago treasured them, saved them, and took the time the identify them. When Artemicia and her husband, James Powell Loftis, were still living in Atlanta, during the Civil War, my great grandmother Rosina Lillian Loftis was born about the time of the Battle of Atlanta. Rosina died at the home in Florida where I live, and along with her possessions were a large set of photographs from her mother's generation and before. When I was still a teenager, I sat at my grandmother's knee and wrote the names on the photos, which no other family members could identify. Thus, if I had not undertaken the task then you wouldn't be looking at your great great great-grandparents now. As I look at them now, I'm glad I took the time. My grandmother always said that after she was gone no one would care about her treasures. I'm pleased now that not only can her descendants benefit, but yours also. That would make her very happy! John and Polly Leak moved to Cass (later Bartow) County GA in 1843, first to Cassville then to Adairsville where they farmed property bordering the railroad a mile south of town. The Leak farm is marked on Gen. Sherman's 1864 map of north Georgia. During the Civil War, the Union sent a band of spies deep into Georgia to destroy the railroad and the South's supply line. On April 12, 1862, spy James J. Andrews and his raiders stole the engine, "General," while its crew ate breakfast. On one leg of the hot pursuit that followed, Western & Atlantic Conductor W.A. Fuller halted the north-bound Rome train he commandeered at Kingston and took over the "Texas" roaring south on its usual run. Fuller dropped the cars and reversed the "Texas" just south of Adairsville near our grandparent's property and continued the charge backwards. The significance of the thrilling "great locomotive chase" in Adairsville history is dwarfed only by the arrival of 100,000 Union troops just over two years later on May 16, 1864. 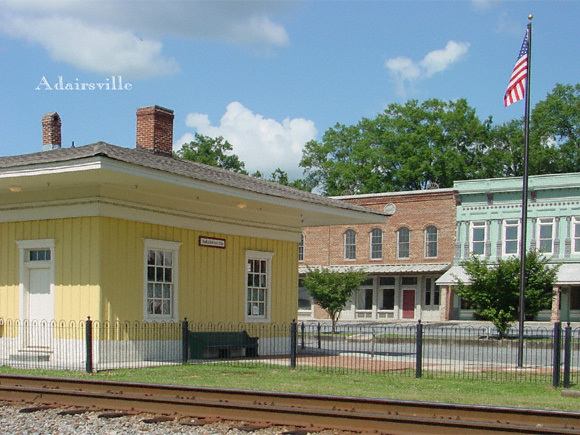 Adairsville celebrates its part in the chase with an October festival each year. The entire original town is on the National Register of Historic Places. Artemicia Leak Loftis was the older sister of our grandmother, Elizabeth Leak Carlile. This original ambrotype photograph depicts Artemicia with an unidentified infant. Artemicia and her husband, James Powell Loftis, survived the Battle of Atlanta, and were among the Civil War's many refugees in 1864. Before the invasion of Atlanta, General Hood's Confederate army urged civilian non-combatants to flee the war zone. Artemicia took her infant daughter, Rosina, born just weeks before, and boarded a refugee train out of the city. The remaining elder children, and their father, James Loftis, buried silver and other items of value in sheets, and gathered what few essential items they could physically carry. They departed Atlanta with a horse and wagon in company with an Irish Catholic family named Kane. On Sep 2, 1864, General Hood retreated from Atlanta, giving General William T. Sherman cause to declare "Atlanta is ours, and fairly won." The Loftis family fled east from Atlanta to Lithonia near Stone Mountain where they took up residence in an abandoned farmhouse. There they were overtaken by Sherman's troops who attempted to field-requisition their provisions and livestock. The women and children were mortified by the encounter. Artemicia married James Powell Loftis Oct 31, 1839 and had 11 children, seven of whom lived to adulthood. She was buried at Riverside Cemetery, Atlanta, Dec 5, 1909 and was described in her obituary as one of Atlanta's pioneer church women. Photo and story from the collection of Mrs. Rosina Loftis McDougal, courtesy of Robert C. Dodd, Jr.
[Editor's Note: According to Franklin Garrett Atlanta Necrology, Artemicia was born Dec 17, 1820 and died just shy of her 90th birthday on Dec 8, 1909. <<<Circa 1870 Elizabeth Leak Carlile Contributed by Tommy R. Carlisle. >>>Circa 1910 Elizabeth Leak Carlile - Enlarged from the group photo below. Circa 1910 Our grandmother, Elizabeth Leak Carlile, with daughter, Ida Clara Carlile Gaines, and four youngest of the Gaines' seven children. Ida Clara Carlile married Andrew Mattison Gaines. Two older boys: Lewda Leak Gaines, left, and Allen Invin Gaines. The little boy is Joseph Gordon Gaines and the little girl is Gladys Beatrice Gaines. Photo contributed by Anne Carlyle Thompson, courtesy of Rev. Jimmy Gaines. Identifications contributed by Ed Case. Whitfield Leak (with white beard, right of center), the eighth child of John and Polly Leak, was born in Laurens County, SC in 1833, four years before his youngest sister, Elizabeth, who was our grandmother. The photo is identified as "Whitfield Leak House---1429 Yamparika," probably Vernon, TX. Read a letter from Whitfield to his sister, Elizabeth. (L-R) Maggie (Jobe) French, Sam Leak, Hattie Parks Truelove, Norvell, Minnie Jobe More, Imo More McKinney, Dave Jobe, Laura Lea Jobe, Robert Truelove, Minnie Leak Truelove, Whitfield Leak, Sarah Newton Hardy Leak, Jim Leak, Belle Leak Petty, Gladys Jobe Russell, Luther Jobe, Jesse Truelove, Sam Jobe, John Truelove, Mary Truelove Modgling, Lena Truelove Cooper, Sallie Jobe McClarty, Lenora Petty Haynes, Bessie Jobe Davis, Sallie Truelove Lowrance. Photo and identifications contributed by Diana Truelove.